Yesterday’s crash of the Polish presidential plane, carrying President Lech Kaczyński and a large delegation of Polish political and defense force leaders, has raised questions about the safety of Polish military and VIP flights. For most Poles, this accident in Smolensk carries echoes of the Miroslawiec crash of a Polish military CASA aircraft on 23rd January 2008 – a fatal combination of poor ground control, pressure to land, and severe weather conditions. Whilst obvious differences are apparent, the question remains – are Poland’s VIP passengers really in the safest hands? Immediately following the crash, attention focused on the aircraft itself. The plane was a Soviet-era Tupolev Tu-154, built in Russia. It is an aircraft type that has suffered 66 serious flight incidents, including 37 hull losses with human fatalities, giving it a poor reputation amongst the flying public and the press. However, aviation experts point out that the number of accidents is almost normal for a type of which over 1,000 have been built. In addition, the rate of accidents attributed to this model can often be put down to the fact that the aircraft has generally been operating in parts of the world which have poorer standards of runways, navigation aids and air traffic control. The aircraft was purchased primarily by Aeroflot, the national carrier of Russia, and was a favourite of carriers in the former Soviet Union, the Eastern Bloc and Africa, where operating standards do not reach those of Western Europe or North America. Very few accidents have been caused as a direct result of mechanical failure, and the Tu-154 compares favourably in terms of accident rates with the DC-9, an American plane of similar vintage. The Polish presidential plane had undergone a full overhaul in December 2009. The plane itself had low flight hours and a low number of landing and take-off cycles for a plane of its age (manufactured in 1990). Unlike commercial aircraft which may be dispatched with minor defects which do not jeopardise the safety of the flight (this is known as a MEL or Minimum Equipment List), the presidential aircraft cannot be dispatched with any defect whatsoever, giving it in theory a higher level of safety. At this stage, there is no evidence at all that the aircraft suffered any technical difficulty that contributed to the crash, though more modern aircraft from Boeing and Airbus, particularly with their improved navigational and proximity warning devices, are considered more suitable for governmental use. Questions are already being asked about why Poland’s government did not choose the safest option available on the market. The crash of the Polish presidential aircraft not only raises questions about the type of plane chosen to carry Poland’s political elite, but also the manner of operation of such flights. Whilst most people would assume that such flights operate in the safest possible conditions, the facts do not support this. Unlike normal commercial flights into airports with the most advanced navigational aids, by pilots familiar with the routes, VIP flights such as that into Smolensk by their nature carry greater risk. First, the pilots are not as familiar with the destination airport, due to their infrequent flights to such locations. Second, in order to provide greater ground security for VIP guests, host countries often choose military airfields over commercial ones, where the privacy and security of the VIP guests can be more easily guaranteed. However, many of these military airports and runways have poorer navigational aids than those demanded by the commercial sector. The Polish presidential jet was due to land on such a military runway in Smolensk. This runway does not have the Instrument Landing System (ILS) almost standard at most major commercial airports. An ILS is a ground-based instrument approach system that provides precision guidance to an aircraft approaching and landing on a runway, using a combination of radio signals and, in many cases, high-intensity lighting arrays, to enable a safe landing during instrument meteorological conditions (IMC), such as low ceilings or reduced visibility due to fog, rain, or blowing snow. Thirdly, pilots on such flights are often under greater pressure to meet their arrival schedules than those operating commercial flights, creating further opportunities for accidents. In some cases, such pressure may simply arise from the flight crew itself, determined to get their important passengers to events of national importance on time. Occasionally, however, there may even be direct pressure from the passengers themselves, even ordering or attempting to order the flight crew to land against the pilot’s own best judgment. Such an incident occurred in 2008 involving President Lech Kaczyński himself. Back then, when Georgia and Russia fought their brief war, President Kaczyński was on his way to Tbilisi to support Georgian President Mikheil Saakashvili in what he saw as a fight with the Kremlin’s “new imperialism”. Air traffic control told the pilot of President Kaczyński’s plane to turn back because it was too dangerous to land in Tbilisi, but the president — who also is commander-in-chief under Polish law — ordered the pilot to land regardless. The pilot refused to land in Georgia’s capital despite the direct intervention, but the incident highlights the differing protocols and conflicts possible on a VIP flight as opposed to a normal commercial flight where the passengers have no access to the flight deck. Pilots refer to this pressure to land (whether direct or indirect) as “get-there-itis”, a disarming term for an extremely dangerous state of mind for any pilot to be in. Commercial operators use what are called Standard Operating Procedures (SOP) to help mitigate these issues and provide clear direction in situations of potential stress and indecision. One such, adopted by most carriers, is that after two failed attempts to land (missed approaches), the aircraft must divert to another airport. This situation may arise in poor weather for example. 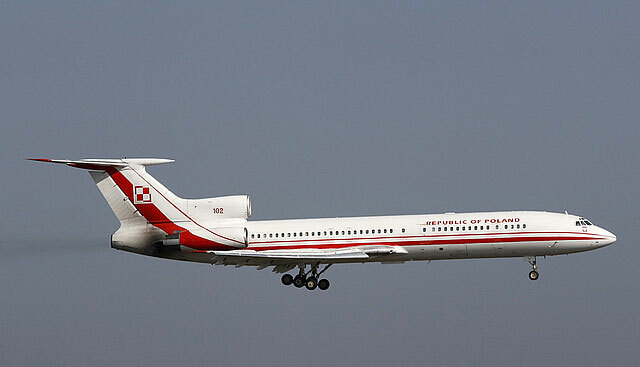 According to unconfirmed reports, the presidential Tu-154 may have attempted to land as many as four times prior to the failed landing and impact.